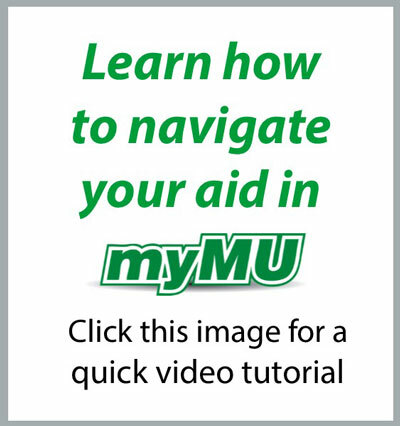 Students may access financial aid records by logging onto their myMU account. 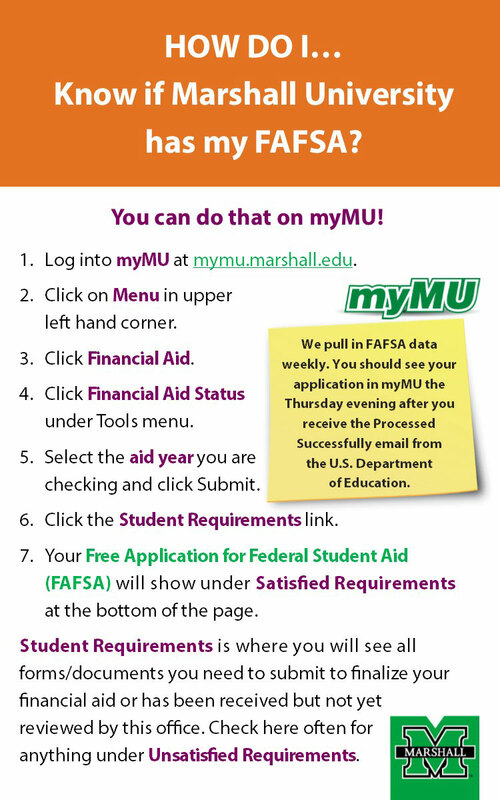 myMU is the campus web portal used to provide students with easy online access to Marshall University records. 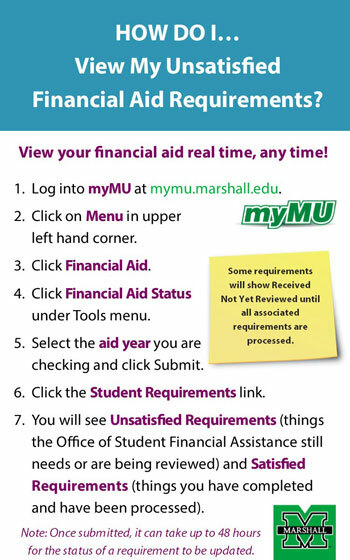 Any student who has problems accessing their myMU records should email helpdesk@marshall.edu or call 1-877-689-8638 . Instructions to give permission to parents or others to view or speak with staff about your records can be found at http://www.marshall.edu/student-affairs/ferpa/. Not giving proxy access means staff in the Office of Student Financial Assistance cannot discuss your awards, requirements, eligibility status or other information with parents or others outside the University. Online financial aid notification via the myMU account is the official method by which students receive information regarding their financial aid application and awards. Financial Aid Status provides you information on your overall status of financial aid by specific award year. This includes information about your cost of attendance, awards, satisfactory academic progress, financial aid history, as well as direct access to your student account (billing) and your academic transcript (registrar). Eligibility provides information on your student requirements, satisfactory academic progress and holds on your financial aid record. documentation may result in cancelation of your awards. You will be notified by email and through a Personal Announcement in your myMU account when you are required to submit verification documentation or other required information to finalize your financial aid. 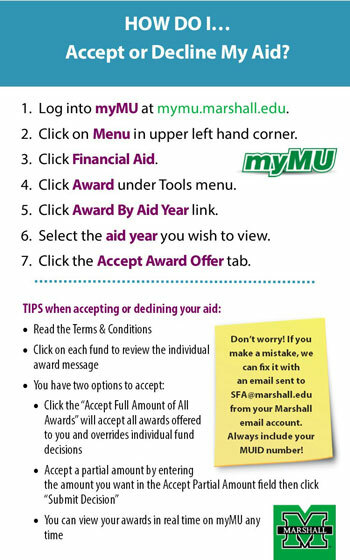 Students may download and print most financial aid forms for completion by visiting www.marshall.edu/sfa and clicking on the Forms & Applications tab. You will be notified by email and a Personal Announcement in your myMU account when you have been awarded financial aid, or when a revision to your financial aid awards has been made. Your awards will list specific types of financial aid offered, the corresponding dollars amounts, and in some cases special messages or instructions related to your awards. Messages usually provide you terms and conditions of the awards. Also, if you must take additional action to receive your awards, you need to follow the instructions provided. The Office of Student Financial Assistance assumes that you have accepted your grant and scholarship offers. However, if you are offered a Federal Work-study award or a student loan, you must inform the Office of Student Financial Assistance whether you “ACCEPT” or “REJECT” those award offers. You may do so on line by accessing your awards in your MILO account. Alternatively, if you wish to reduce or reject any portion of your financial aid package, you may download and complete an Award Adjustment Form and submit it to the Office of Student Financial Assistance. To adjust aid for Fall 2019, Spring 2020 or Summer 2020, complete the 2019-20 Award Adjustment Form. To adjust aid for Fall 2018, Spring 2019 or Summer 2019, complete the 2018-19 Award Adjustment Form. Your financial aid awards will automatically credit to your student account when all eligibility requirements are met. Your financial aid will not credit to your student account unless all of your Student Requirements are met, you are making Satisfactory Academic Progress (or your Satisfactory Academic Progress Appeal has been approved), and you have no financial aid holds on your account. Awards are initially offered based on assumed full-time enrollment. If any of the criteria listed below apply to you, please download and complete an Award Adjustment Form and submit it to the Office of Student Financial Assistance. To update your plans/status for Fall 2019, Spring 2020 or Summer 2020, complete the 2019-20 Award Adjustment Form. To update your plans/status for Fall 2018, Spring 2019 or Summer 2019, complete the 2018-19 Award Adjustment Form. “ACCEPT” your loan offer on line in your MILO account. You may have other requirements to receive other loans or other financial aid awards, which can be viewed in your Special Messages within your Award Package in MILO. If you fail to follow through on providing documentation or information to fulfill any outstanding requirements, your financial aid offer is subject to cancelation. Also, if you do not complete required entrance loan counseling or sign a master promissory note, your loan offer will be canceled. The earliest financial aid may credit to students’ billing accounts is 10 days before the semester begins. However, financial aid will not credit to the student’s account unless all eligibility requirements have been met and verification has been completed. In addition, if the student is taking out a student loan, the student must have completed entrance loan counseling and completed a master promissory note for the respective loan program. The 2018-19 Financial Aid Disbursement Calendar provides the dates in which financial aid is scheduled to disburse or credit to students’ accounts. Pending financial aid is a temporary status and is used for financial planning purposes only. Pending financial aid allows the Bursar’s Office to defer payment of student’s tuition, fees, residential and board payments until the financial aid is finalized and credited to the student’s Bursar account. Students are responsible for making payment for the difference between bursar charges and financial aid awards by the designated due dates established by the University. Financial aid awards are not final until they have credited to the student’s account. Under the Marshall University OASIS Payment Plan, students may select to make three equal payments of their outstanding charges for the fall or spring semester after any applicable financial aid has been applied. For more information, visit www.marshall.edu/bursar. When your financial aid for the semester/term exceeds your direct charges (tuition, fees, etc.) on your student bill, you are entitled to a refund for the difference to use toward other educational expenses such as books and living expenses. The Bursar’s Office issues refunds to students beginning the first day of classes. Only those students whose financial aid was credited/disbursed 10 days prior to the semester/term with a credit balance will receive a refund on the first day of the semester/term. After this office has credited/disbursed your aid to your student account, refunds for any payments in excess of your University balance will be issued by the Bursar’s Office in 7-10 business days. It is important to note that if you depend on your financial aid to purchase your books, as explained above the earliest you may receive a refund is the first day of classes. Please plan accordingly. Total withdrawal from the university is defined as dropping all classes for which a student is registered. When students withdraw from all courses on or before the 60% point in time of an academic term, the Office of Student Financial Assistance is required to review your financial aid awards to determine whether financial aid funds must be adjusted in accordance with federal and state regulations. The policies on treatment of financial aid for total withdrawal are specific to each designated financial aid program and are applicable only if the student has received those particular kinds of funds. If a student received various types of financial aid, more than one policy may apply when determining revised financial aid eligibility. For example, if a student withdraws during the 5th week of the semester, the student would have 50% of his/her tuition charge reversed. Simultaneously, if a student received an institutional scholarship for the semester in the amount of $2,000, 50% or $1,000 of this scholarship would be returned to the respective financial aid program. The federal policy for return of Title IV funds maintains that a student retains only that portion of federal aid that the student has earned based on time in attendance before withdrawal. The percentage of time that the student attended an academic term determines the amount of federal aid that must be returned to the federal government. This federally mandated policy is independent of Marshall University’s institutional refund policy due to withdrawal. Marshall University, as required by federal statute, must recalculate federal financial aid eligibility for students who drop out, who withdraw, or who are dismissed, prior to completing 60% of the semester or the financial aid payment period. This formula determines the percentage of the semester completed, which is the same percentage of earned financial aid. If a student earned less financial aid than was disbursed, Marshall University is required to return the unearned portion of the financial aid to the respective federal student aid programs. In some cases, the withdrawn student may be required to return all or a portion of the federal funds disbursed even when the funds are issued directly to the student. If the student (or Parent in the case of PLUS Loan) is required to return a portion or all of the loan proceeds, the calculated amount would not have to be returned through this calculation, but be repaid according to the loan’s terms. If a student qualifies for federal aid that has not yet disbursed and less aid is disbursed than earned, the student may receive a late disbursement for the difference. When a student that has begun attendance fails to earn a passing grade (has a zero GPA) at the end of the semester, Marshall University for federal student aid purposes must assume that the student has unofficially withdrawn or dropped out. If the student has unofficially withdrawn (shows zero earned hours at the end of the semester), 50% of the student’s federal student aid for the term is considered unearned and may result in a reduction of federal aid. However, when Marshall University can document attendance or participation beyond the 60% point in the semester, the student may be able to retain 100% of his/her federal student aid under these circumstances. Marshall University has an official grading policy that provides instructors with the ability to differentiate between those students who complete the course but failed to achieve the course objectives and those students who did not complete the course. The instructor is required to notify the Director of Student Financial Assistance in the case of the latter. Students are encouraged to consult with a Financial Aid Counselor to receive information about the full implications of withdrawing from the University.